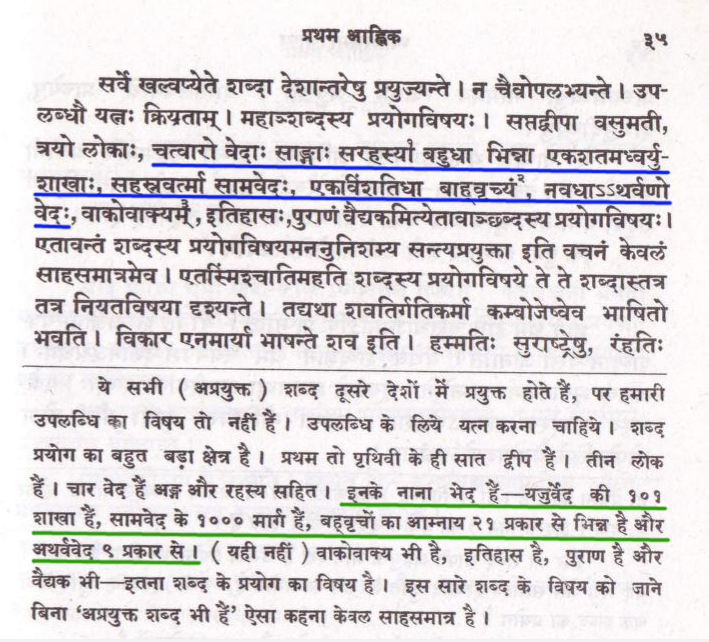 This answer quotes Mahābhāṣya of Patañjali as the Vedas having 1138 1131 śākhās (recensions). Originally as per Mahabhasya of Patanjali there were 21 Shakhas of RigVeda, 101 Shakhas of Yajurveda, 1000 Shakhas of SamaVeda and 9 Shakhas of Atharvaveda. Thus total 1138 1131 Shakhas of total Vedas. I'm looking for the actual line from the Mahābhāṣya (in Sanskrit or its English translation) which says this. Also, according to Patañjali, is the number of śākhās 1131 or 1133? Panini has written a great treatise called Ashtadhyayi on Sanskrit Vyakarana (grammar). Katyayana has written Vartika i.e commentary on Panini's Ashtadhyayi which became core part to Sanskrit grammar. Patanjali further elaborated on Ashtadhyayi along with Vartika of Katyayana in his work called Mahabhashya which discuss selected verse of Astadhyayi long with Vartika. By the way these three Munis (Panini, Katyayana and Patanjali) who have done such a great work on Sanskrit grammer are known as MuniTraya (मुनित्रय). The Sutras found in 1st pada of 1st Adhyaya of Panini's Ashtadhyayi are discussed along with Vartika of Katyayana in 9 āhnika​. The fitst āhnika​ is पस्पशाह्निक (IAST: paspaśāhnika). You can refer Mahabhashya in IAST here. The present Bhashya by Patanjali is on 12th sutra of Ashtadhyayi, refer pg. 9. Some English translation version of Ashtadhyayi and Mahabhashya are available on Internet Archive e.g. this and this. I'm finding bit trouble for locating present line for time being. So, totaling 101 + 1000 + 21 + 9 = 1131 number of Shakhas. Make efforts in discovering them. The field for the use of words is very large. There are the seven islands of the earth, three worlds, the four Vedas with their accessories and esoteric doctrines diversely varied. There are the hundred branches of the Adhvaryuveda and thousand ways of Sāmaveda, twenty-one-fold Bāhvṛcya, ninefold Ātharvaṇaveda, the dialogue literature, legends and purāṇas, medical science, so much is the field of the use of words. Without examining such a large field of the application of words, to say that there are words which are not used, is merely boldness. Not the answer you're looking for? Browse other questions tagged vedas identification-request recension mahabhashya patanjali . In the Vedas, does the word 'manuṣya' ever have a special meaning? Do the Vedas say that Indra can grant moksha? Which are those 400 words of Veda not known or understood to even Yaska?